The eccentric King Ludwig II of Bavaria rides at night in a sleigh from Neuschwanstein to Linderhof. 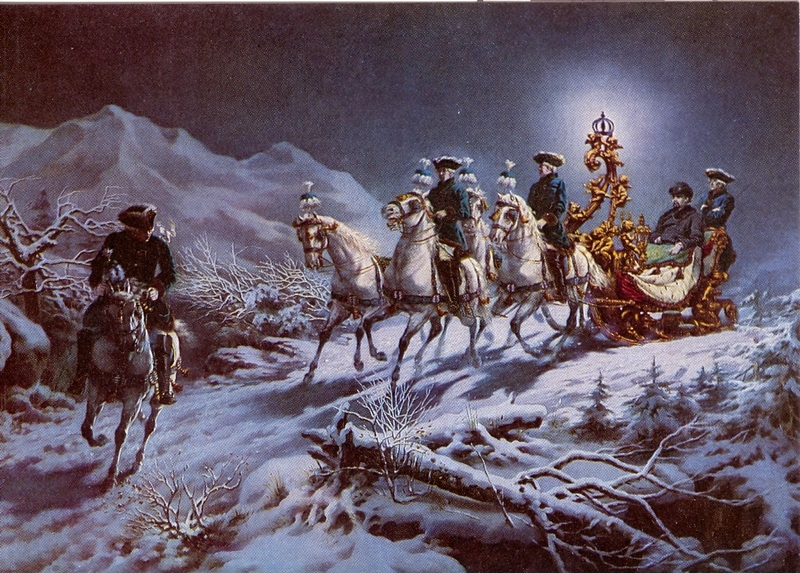 The sleigh in baroque style, built by Johann Michael Meyer in 1872, has been provided with an electric lamp inside the crown on the ornamental front of the body. The battery was installed in the boot. Ludwig II (1845-1886) regularly made such night rides, hence he was nicknamed the ‘Night Rider’. The riders and groom are wearing costumes from one hundred years earlier. Four grey horses have been harnessed to the sleigh, the left ones ridden à la Daumont, without coachman but with a groom sitting behind the body of the sleigh. A mounted scout precedes the equipage. This fairylike scene was deliberately created by Ludwig II who saw himself as the ‘Moon King’ and concentrated on his artistic and architectural enterprises. The castles Neuschwanstein and Linderhof were both built by Ludwig II and the distance between them is about 30 kilometer via dirt roads. The night ride will have taken about three hours, provided the horses were well shod for trotting on the snow.